NETWORK FINALS: NBC’s NHL PLAYOFFS game gained 0.1 in final numbers. In addition, the 8PM MASTERCHEF JR rerun lost 0.1. CABLE HIGHLIGHTS: The latter rounds of ESPN’s NFL DRAFT were at 0.59, with the NFL Network coverage at 0.34. TBS’s NOT THE WHITE HOUSE CORRESPONDENTS DINNER special episode of FULL FRONTAL was at 0.41, while CNN’s coverage of the actual WHITE HOUSE CORRESPONDENTS DINNER peaked at 0.24. HBO’s ROCK & ROLL HALL OF FAME special was at 0.24. 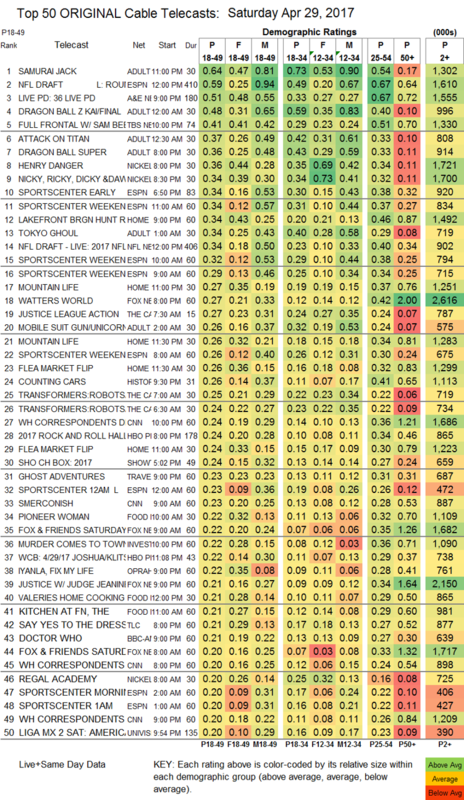 In the absence of major sports events on Saturday, Adult Swim took the cable lead with SAMURAI JACK, down 0.04 to 0.64. The rest of the Adult Swim line-up was as follows: the two DRAGON BALL episodes at 0.48/0.36 (respectively down 0.02/0.04), ATTACK ON TITAN down 0.04 to 0.37, TOKYO GHOUL down a tick to 0.34, MOBILE SUIT GUNDAM also down 0.01 to 0.26, HUNTER X HUNTER down 0.02 to 0.30/656K, NARUTO up 0.01 to 0.27/560K, and GHOST IN THE SHELL up 0.04 to 0.27/532K. Primetime animation was also in the Top 10, with Nickelodeon’s HENRY DANGER steady at 0.36, and NICKY, RICKY, DICKY & DAWN up 0.02 to 0.34. History’s COUNTING CARS rose 0.02 to 0.26. On Food Network, PIONEER WOMAN ticked down to 0.22, VALERIE’S HOME COOKING rose 0.03 to 0.21, KITCHEN AT FN was down 0.02 to 0.21, and TRISHA’S SOUTHERN KITCHEN lost a tick to 0.18. OWN’s IYANLA FIX MY LIFE fell 0.08 to 0.22, and BOOK OF JOHN GRAY was down 0.05 to 0.15. TLC’s SAY YES TO THE DRESS rose 0.03 to 0.21, and NATE AND JEREMIAH BY DESIGN was at 0.15. On BBCAmerica, DOCTOR WHO fell 0.05 to 0.21, and CLASS was down 0.02 to 0.06. AMC’s THE SON dropped 0.04 to 0.14.